My love of Paris started as a young girl. My maternal great-grandmother was born there, my first facial was by a French esthetician (Bernadette), who cleared my skin with one treatment, after battling with acne for years. The first skincare line that I choose to retail and incorporate into my business was the French skin care line of Rene Guinot from France. In the 70’s it was the most respected and complete skincare line used in the top spas around the world. At that time the market wasn’t saturated with skin care products the way it is today. My love of French fashion, music, art, food, skincare and the city of lights, has had a big influence in my life. When Carl (my husband) and I made the decision to take each of our grandchildren somewhere special in the world when they turned 13, we took our first grandchild (Kendall) to Paris. April in Paris was a song I remember my mother singing, and now I know why. We took Kendall to Paris in April, and spent a week celebrating her 13th birthday. I couldn’t wait to show Kendall Paris, and take her to some of the places that I had visited as a young girl. There are a few things I always noticed about Paris: there’s a boulagerie on just about every block, great pharmacies on every other block, and upscale boutiques displaying beautiful unique wares as commonly as a baguette. We choose the George V Hotel, and I must say it is one of the most beautiful hotels I’ve ever seen. 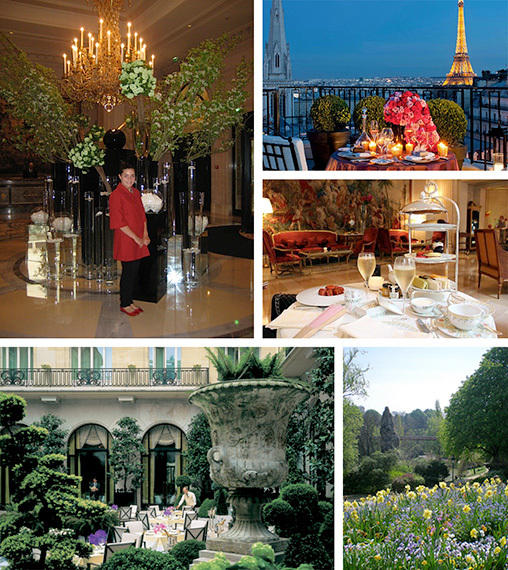 It is just steps away from the Champs-Elysees, and we had our own private terrace overlooking all of Paris. The hotel and spa, if you have never been, is truly a must. The staff is warm, and friendly, and the atmosphere so very elegant. The attention to detail is exquisite. We walked into the hotel and Kendall was given one of the most beautiful Easter Baskets I’ve ever seen with french chocolate eggs and colorful Laduree macaroons. Being a spa girl, I was enthralled with our hotel’s incredible spa. Kendall and I visited the spa almost every morning. One morning I noticed that Kendall had been in the gym for 45 minutes, we were supposed to meet in the jacuzzi in 30 minutes. I put my robe on to go and check on her, she was on the treadmill having an in-depth conversion with Hugh Jackman… no wonder she forgot about me in the jacuzzi! I’ll write more about our adventure in beautiful Paris in my next blog! When you look through the eyes of a child, the world becomes a better place.